UREC is the proud sponsor of the North Baton Rouge Youth Development Program (NBR)– a summer intensive program that provides high school students in grades 9 through 12 with career exploration and service learning experiences. This summer, ten NBR fellows participated in professional internships at local businesses to gain experience towards their future career goals. Participating business partners included: Our Lady of the Lake Regional Medical Center; State of Louisiana Department of Culture, Recreation & Tourism; East Baton Rouge Parish Law Office of the Public Defender; LSU Athletic Training Department; Southern University School of Nursing; Park Forest Elementary Freedom School; WTAA Engineers and Stantec. 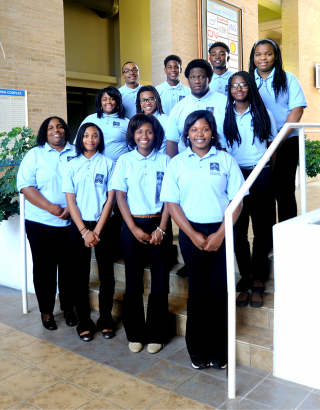 Fellows also participated in weekly academic courses through a partnership with the Engineering Summer Institute, which is a program of the College of Engineering at Southern University and A & M College. UREC’s North Baton Rouge Youth Development Program is sponsored in part by ExxonMobil and The Huey and Angelina Wilson Foundation. The program was administered by Lauri Patterson, Instructor and Program Coordinator, and Richard Moncriffe,III, Program Coordinator. The 2014 NBR fellows were: Chanecia Brown, 10th grade, Broadmoor High School; Taria Dearbone, 9th grade, Baton Rouge Magnet High School; Darion Faulkner, 10th grade, Scotlandville Magnet High School / Center of Excellence; Paul Franklin, 10th grade, Scotlandville Magnet; Kiyanna Givens, 10th grade, Lee High School STEM and VPA Magnet Academy; De’Jah Hamilton, 12th grade, Scotlandville Magnet; DaMari Johnson, 10th grade, Central High School; Aundrea Lee, 10th grade, Baton Rouge Magnet High School; John McGee, 12th grade, Belaire High School and Elvis Richard, Jr., 10th grade, Scotlandville Magnet. “This summer, I got the chance to experience what life would be like going into a career of my choice,” said NBR Fellow and aspiring engineer Elvis Richard, Jr. A second year NBR Fellow, Richard worked at Stantec where he observed civil engineers work on various projects for roads, bridges and traffic management.